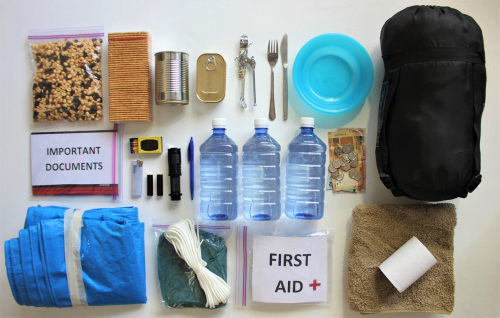 What Should Be in an Emergency Bag for Hurricanes or Flood Conditions? According to the U.S. Federal Emergency Management Agency (FEMA), emergency evacuations are more common than many people suspect. The largest in U.S. history occurred in 1999, when 3 million residents on the Atlantic coast left their homes as Hurricane Floyd approached. However, in addition to hurricanes, tornadoes, flash floods, wildfires, toxic spills, prolonged power outages and even severe frigid weather are among the unexpected events that may trigger a local evacuation order. “Be Prepared” is the general advice for homeowners, but what about specifics? One common recommendation is to keep an evacuation bag ready at all times. It’s often called a “Go Bag” by emergency authorities, because that’s exactly what it’s for: If the need to quickly evacuate your home ever occurs, you’re already prepared to go in a hurry. Three-day supply of non-perishable food and water for each occupant. Don’t count on shelters or other alternate destinations to provide food. Local road maps with evacuation routes clearly marked. Prescription medications for anyone who requires them as well as over-the-counter remedies such as aspirin. Change of clothing for a few days per each person. Extra car keys, credit cards and cash. Battery-powered radio with extra batteries. Photocopies of vital documents like birth certificates and passports, medical and home insurance policies, as well as relevant contact info for your insurance agent. Backup of important files on home computer on portable flash drive. If you have pets, include food and water for them, too. If dangerous weather conditions or other hazards loom, monitor local media for announcements by emergency agencies. Evacuate your home promptly if/when you are advised to do so. Don’t delay, waiting and hoping that conditions may improve. Grab the Go Bag and go. This entry was posted on Wednesday, February 6th, 2019 at 8:15 pm and is filed under Tips & Safety. You can follow any responses to this entry through the RSS 2.0 feed. You can leave a response, or trackback from your own site.